Staying fit and flexible is a crucial part of maintaining your health. If you have a hard time getting to the gym, or are just looking for ways to work out in your Chicago apartment, yoga is a great way to strengthen the body and improve flexibility. Want to be lean and limber? Give the yoga poses below a try. This common yoga pose is perfect for stretching out your hamstrings. The pose is simple; just bend at the waist and place your palms flat on the ground shoulder-width apart. Your body should form a V if done correctly. Make sure that your heels stay firmly glued to the ground when doing this stretch. As you become able to hold this pose longer, you will be able to also feel the stretching in your ankles and Achilles tendon. This pose is great for stretching both your legs and your back. You will need to start this pose in a seated position with your legs out as straight as possible. Make sure to keep your knees straight the whole time to get the deepest stretch that you can. Reach your hands into the air above your head, spreading your fingers, then slowly bend forward, grabbing your flexed feet. Try to bring your forearms flat to the ground next to your feet. Your head should go forward with your back, eventually resting parallel to your legs. Hold the stretch for 30 seconds to start and build yourself up to longer holds. The Bound Angle Pose is a great option for those looking to not only stretch out their groin muscles, but also to help open up the hips and get greater flexibility in the pelvic area. From a seated position, spread your legs out as wide as is comfortable, keeping your feet flexed. Lean over, grabbing the top of your feet, and lowering your torso towards the ground. 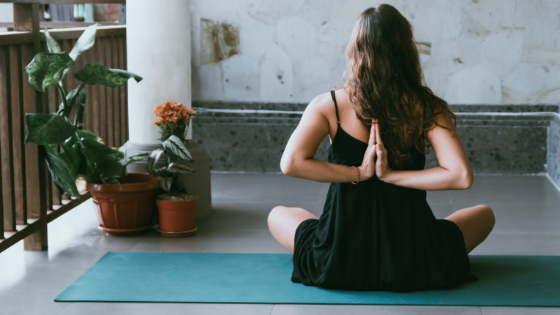 If you are looking for a new apartment in the Chicago, Illinois, area where you can test your new-found yoga skills, stop on in or give Cobbler Square Lofts a call to find the perfect apartment for your healthy lifestyle.